An actuated pressure switch makes or disrupts electrical contact in order to either trigger an alarm or switch something on or off. Switches are programmed to activate at certain pressure points, and may be designed to make contact either on pressure rise or on pressure fall. Pressure switches can sense changes in gas and/or liquid pressure. Depending on the application, a pressure switch may be set to automatically open or close to interrupt or to initiate the flow or current involved. Pressure switches are always set to at least one point of pressure, or actuation point, to which it will automatically respond. Some switches are factory-set and cannot be changed, but there are also a variety of adjustable pressure switches available, which allow the user to adjust the actuation point or points. Many pressure switches work with several points of pressure, and are therefore able to act as more complex regulators of pressure systems. In addition, there are high pressure switches and low pressure switches that are better suited for working at certain pressure ranges. There are two primary types of pressure switches: air pressure switches, also known as pneumatic pressure switches, are designed to sense and respond to gas pressure, while hydraulic pressure switches operate in response to liquid pressure. Practical applications for different sorts of pressure switches abound. Air compressor pressure switches signal to the compressor when more pressure is needed, when optimal pressure has been reached, and also when there is inadequate air supply for the suction stage. Oil pressure switches are used in cars to monitor the engine’s oil pressure and to signal when the oil pressure has gotten critically low. Both well pump pressure switches and water pressure switches regulate water pressure by actuating a flow of water when pressure drops below a certain level and stopping the flow when the system reaches its optimal pressure. Different sorts of furnace pressure switches either monitor for an adequate supply of fuel or monitor the furnace’s supply of fresh air. Differential pressure switches help regulate differential pressure between a cavity and an open atmosphere, such as the pressure between an airplane cabin and the outside atmosphere. 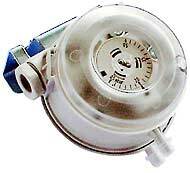 Vacuum switches help regulate the pressure between two closed cavities by responding to changes in negative pressure. Ultrasonic level switches are ideal for use in tanks that store mass quantities of liquid, since they are unaffected by large changes in pressure and temperature; they also have no moving parts and therefore have no problems with sediment. Finally, displacer level switches maintain the level of liquids in a sump based on a set point. Displacer level switches are low cost, simple to operate, easy to adjust and reliable. Each of these types of pressure switches has numerous applications in industrial equipment and processing. Pressure switches are specifically designed for alarm, shutdown, activation and control of pneumatic and hydraulic processes and equipment, and thus work well in any instance in which regulation of flow is required. Utility plants, public buildings, process manufacturing, automotive and home appliance industries all use pressure switches extensively to regulate fluid pressure and to provide safety measures for high pressure applications. The wide range of uses for pressure switches varies, anywhere from space stations to industrial heating systems. Pressure switches are important for the safe and successful operation of filters, furnaces, blowers, generators, cars, off-road equipment, compressors, turbines, wastewater applications, process equipment, pumps, panels and pipelines. Some batteries use pressure switches to prevent over-charging by switching off the charger when the internal cell pressure reaches a certain level. Pressure switches are especially useful in industrial facilities because they are a safe and cost-effective alternative to safety relief valves. Relief valves sometimes leak pressure during operation, wasting energy and in some cases causing a safety hazard, whereas use of pressure switches allows regulation of pressure at the source. Pressure switches can also accurately detect pressure problems and automatically shut down the process before the danger increases. Pressure switches sense pressure in a variety of ways. Some switches use an elastomeric diaphragm that reacts to changes in the pressure level and actuates either a mechanical switch or a valve. Others work in conjunction with a pressure transducer and a display meter. Electronic pressure switches usually make use of a piezoresistive pressure sensor that measures the pressure level and converts the level into an electrical signal; these often include a digital display. Construction materials for pressure switches vary depending on the applications, but can include acetal, brass, polycarbonate, plated steel, glass reinforced polyester, polyvinyl chloride and cast aluminum. Some things to consider and evaluate when looking for a pressure switch are accuracy, electrical output, temperature compensation, temperature output and the material to be handled. Also important are operating temperature and capacity to operate with vibration and shock. The advance of pressure switch technology has made pressure switches an integral part of making processes involving pressurized fluids safe and dependable.